The Potato Eaters presents five figures of which three are females and two are males. One of which appears to be younger than the others and standing before her family. The meal is simple consisting of baked potatoes without any type of dressing. Spices were expensive and imported from other areas. This meal was a regular staple for people who did not have the access to the refrigerated varieties we have today. The other woman is serving coffee for the group through cheap cups and a pot. You can see the conversation within the picture as the family discusses their daily happenings. One might be talking about the hens and the other about the saving of seeds. Their lives consumed them and filled up their conversational needs. It was all about survival. The colors are dark which gives the painting a dark and dirty look. On the ceiling is a single hanging lamp that brightens the families faces. Even though each female is wearing drab clothing and a bonnet we can see a touch of youth behind the center figure's face. Life has yet to wear her down as you can see from the wonderment in her eyes. As a peasant farming family clothing was likely in high demand and coarse by nature. People simply didn’t throw their clothes in the washing machine or run down to Macy’s for another pair. The depiction is a real family in the spirit of naturalism painting styles. At this time the Great Recession (before the modern one) ran until 1879. This time was replaced a few decades later by the Great Depression of the 1930’s. The painting was completed by a young Vincent Van Gogh in 1885 who had not yet mastered his skills. Poverty was still everywhere as people have not had equal opportunities to achieve economic footing. It was just the beginning of a more global economy. This picture is about poverty and the simplicity of life that existed at the time for a huge percentage of the population. 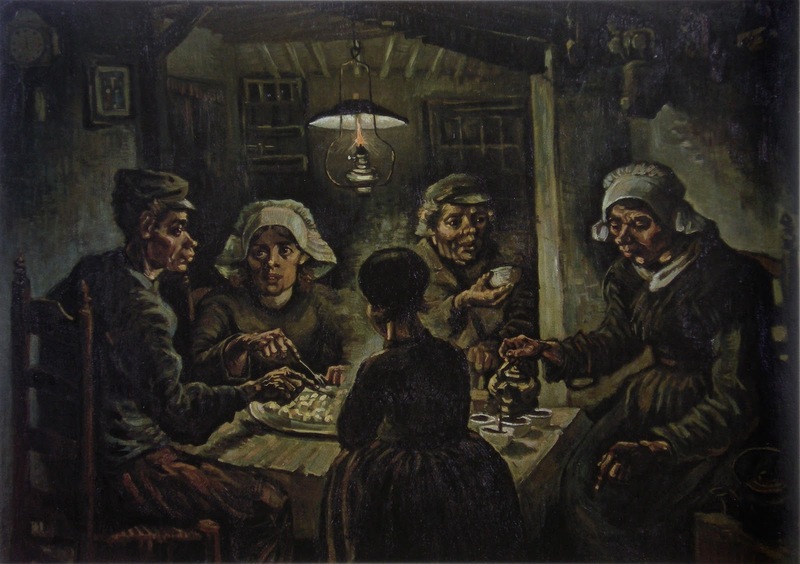 What Van Gogh was capable of doing was creating a “snap shot” of life in the rural countryside. Even though they were poor they were still together. To him people actually worked hard to achieve the things they needed in their lives. Imagine if we were living back then where backbreaking work was the norm and only a very few luxuries of life were available. There were no credit cards, buses, racks of clothing, and medical benefits. With such a hard time people had an average mortality rate of 50 years or less. Now look around at all the things you have! Do you still have each other? Perhaps their poverty provided them a rare gift?